The circular cut aquamarine gemstone give this stunning ring a vintage aesthetic, ideal for the modern-day woman partial to retro glamour. 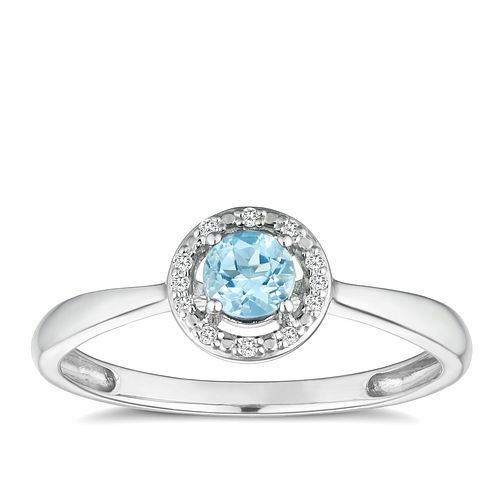 The 925 rhodium plated silver band give this ring a polished finished, and the central aquamarine gemstone is framed with a set of 0.03 carat diamonds making this a beautiful piece of jewellery for those looking to make a dazzling statement. Silver 925 Rhodium Plated Aquamarine & 0.03ct Diamond Ring is rated 5.0 out of 5 by 1. Rated 5 out of 5 by Anonymous from Felt like a princess! My mum bought me this for my 21st birthday and I couldn't think of a better gift. The ring literally sparkles when it hits certain lights, absolutely stunning! I would say though, that the picture shown on the website of the stone is a lot more blue than the real thing, which didn't bother me at all - in fact I preferred it! But be aware of this when buying the ring.